White Tara is a rainbow goddess and an 8th ray Master. The 8th ray contains all the previous 7 rays. White Tara is the new Chohan of the 8th ray. A Chohan is an Ascended Master who is appointed to focus the Christ Consciousness of their ray. She is here to help us with expansion of the heart chakra towards compassion. White Tara is one of the Buddhist goddesses of compassion. She once walked this earth in a body just like us, but over time, humanity has elevated her to goddess status. 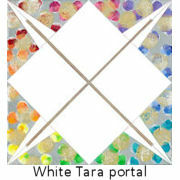 White Tara’s symbol is a rainbow. White contains all the colours, so she too is Master on all the rays. White Tara works here at the portal with the protecting Masters. Once they have battled, cleansed and cleared, White Tara steps in with grace to bless, heal and create in Light. She has very few chelas (pupils), meaning she does not stand with many people as ascension Teacher. When she does, know you are on a chosen path with the Master. She is with you to help you attain far sight and clear vision, to see in truth, and be in compassion. At the moment Ascended Master White Tara is working with the Elohim of the 8th ray. Ascended Master White Tara has an aura that fans rainbow colours from left to right. and soft, yet her energy is of contained power. She always appears in full headdress, with gold ornaments hanging from it. 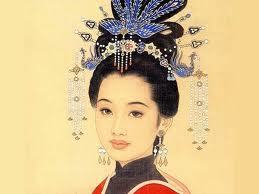 Her appearance is delicate and soft and yet her energy is of contained power. Her portal /painting as shown above is available as a portal card or portal print. Her energy flows from the print 24/7. It is wonderful to have her sending her energy into a room 24/7 via the print, or place the card on a chakra and receive the Masters energy directly into the chakras.